SUPERSTRUCTURES has been performing mandated exterior wall inspections for many of NYC’s most prominent buildings since the inception of the City’s first façade inspection ordinance in 1980. Every five years, facades of all NYC buildings over six stories must be examined by a qualified professional, and a report filed with the DOB. Conditions identified as UNSAFE must be corrected on an expedited basis, and conditions identified as Safe with a Repair and Maintenance Program (SWARMP) in one inspection cycle must be corrected prior to the filing deadline of the following inspection cycle. The current FISP inspection cycle, Cycle 8, commenced on February 21, 2015, and will run through February 21, 2019. Every succeeding Inspection cycle involves a change effected by the DOB which causes some confusion for both Owners and their inspecting professionals. For example, staggered inspection cycles, and the term “QEWI,” or Qualified Exterior Wall Inspector, were introduced in the previous inspection Cycle 7 (2010-2015). In Cycle 8, the significant change has been the introduction of the “DOB NOW: Safety” portal for all FISP (LL11) reports and related filings. The DOB has rescinded its policy requiring that documentation of Work Permits be produced for existing balcony and terrace enclosures. This requirement, which stipulated that undocumented balcony and terrace enclosures would have to be removed, had been introduced by the DOB, to the consternation of many, in July 2014. Based on recent experience, the DOB is now issuing ECB violations in instances where previous or current cycle SWARMP items have not been repaired prior to the initial “SWARMP Recommended Repair Date” contained in the FISP (LL11) Critical Examination Report, and a “new” (extended) repair time frame has not been obtained from the DOB. To explain: DOB Rule 103-04 governing FISP (LL11) compliance filings requires that the QEWI, in their Critical Examination Report, provide detailed recommendations for repairs or maintenance of SWARMP items, including the recommended time frame (indicated in MM/YYYY format), for such repairs or maintenance to be performed “to prevent the conditions from becoming unsafe.” The FISP compliance form (TR6) also requires inclusion of the earliest SWARMP Recommended Repair Date contained in the FISP Report. The Rule also stipulates, that in cases where the SWARMP repairs will not, for any reason, be made within the recommended time frame, it is the Owner’s responsibility to retain a QEWI to request an extension of the recommended time from the DOB. Extended repair time frames may be requested – up to the end of the applicable Sub-cycle of the following inspection cycle (e.g. Sub-cycle 7C to 8C). The request must be accompanied by supporting documents from the QEWI justifying the request for a new time frame. The department may approve or disapprove such a request. We recommend that if an Owner has not yet completed correction of SWARMP conditions, they review the recent FISP Critical Examination Report, to confirm the earliest SWARMP Recommended Repair Date listed, and retain a QEWI to examine the SWARMP conditions and, if justifiable, request an extension of the Recommended Repair Date from the DOB. Owners should beware: Violations have been issued to buildings with missed SWARMP Repair Dates, even though SWARMP repairs were underway. Search for other information on facade-compliance filings. DOB NOW also provides the DOB an efficient method of tracking FISP (LL11)-related data, including details of the FISP Reports as well as statistical information on QEWI’s, building Owners and their buildings. In order to access DOB NOW, QEWI’s and Owners (or Owner’s Representatives) who do not have an active “eFiling” account with NYC Development Hub must create online “eFiling” accounts with DOB NOW. The QEWI, retained by the Owner, conducts the critical examination of the building facades, railings, guards and appurtenances, and prepares a FISP Critical Examination Report in the prescribed DOB NOW digital format. The Owner pays the Filing Fee as well as any other required payments (e.g. Late Filing Fees, or other penalties) on-line. The QEWI makes a final review of the filing, makes any necessary changes, confirms that fees have been paid, and transmits the completed report to DOB NOW. In cases where the Initial Filing has been rejected, the DOB NOW email will include “review comments,” along with a note that an “acceptable” report must be filed within 45 days of the date of the email, in order to keep the current Initial Filing date and filing fee. The QEWI (and Owner, when necessary), address the DOB NOW comments and “re-submit” the Initial TR6/FISP Report to DOB NOW. Once the Initial TR6/FISP report has been uploaded to DOB NOW, all subsequent compliance “actions” are filed in the system. These actions include: Subsequent or Amended Report and TR6 filings, UNSAFE Notifications (FISP3), Initial and Additional Extension Requests (for Unsafe repairs), Sidewalk Shed Removals, and others. Owners and Owners Representatives who currently have an active “eFiling” account with NYC Development Hub do not need to create a separate DOB NOW account. Go to the DOB NOW “Welcome to eFiling” Click on “Register for electronic filing” just below the “Login” button. Fill out all requested information. Below the section titled User Account Information you will need to select one of two options. Please select the first listed option – “I do not have a license or DOB Issued ID # – (includes owners, building managers or owner representatives).” Enter your name in “Agreement” and click “Submit” to create your account. DOB NOW will send an email confirmation. For assistance in creating your eFiling account, or if you would like us to provide a proposal, please contact us. All railings and guards must be inspected for both structural stability and code compliance. Structural safety is evaluated based on lateral load stability, the condition of the materials generally, and at connections and anchorage points. Based on visually observed conditions, invasive load testing, pull-testing, and destructive or non-destructive testing may be performed at the option of the QEWI. 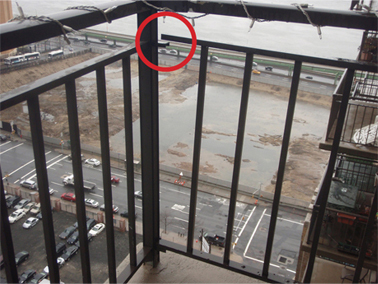 Code compliance will include inspection of the railings and guards with respect to codes in effect at the time they were installed or substantially altered: Does the railing or guard meet the height and configuration requirements (spacing of intermediate and bottom rails) as well as the structural load requirements stipulated in the building code in effect at the time the building was constructed, or those in effect at the time the use or occupancy of the building was changed, if applicable? Per the intent of DOB Rule 103-04, “structural soundness” of railings and guards must be classified as “Safe, SWARMP or Unsafe.” Code compliance issues must be “stated” only. Fire escapes are inspected for structural stability only. If the observations reveal that the balconies, handrails or connections are Unsafe, then the balcony, terrace, roof or other area must be vacated until the defective condition has been repaired and made safe. 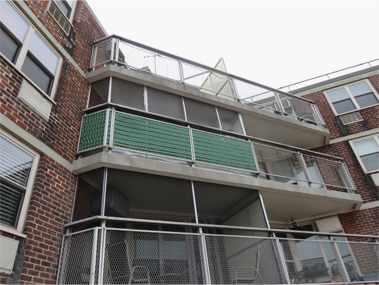 The first required round of balcony and railing inspections occurred late in Cycle 7, with retro-active Supplemental Balcony and Railing Inspection Reports due on February 2, 2015, just prior to the end of Cycle 7. The report was to include a notification of the client of non-code-complying items, along with a course of action to be implemented and addressed by the close of the building’s applicable Cycle 8 Sub-cycle (8A, 8B, or 8C). Enclosures such as “closed-in” structures on or within balcony or terrace handrails/guards, at balconies or terraces must be inspected by the QEWI who must state the status of the structural stability of enclosure. To read the DOB’s “Balcony” Memo issued on May 5, 2014, and other related documents, see “Related Documents and Links” tab. The prohibition on designating the condition of a window air conditioner as Safe with a Repair and Maintenance Program (SWARMP) was deleted. Previously, window A/Cs were classified as either Safe or Unsafe. The Unsafe designations were then being applied to the entire building, even where the only issue was a minor air conditioner infraction. This deletion will allow air conditioner conditions to be designated as SWARMP when appropriate. February 21, 2017 signaled the close of the Cycle 8A reporting window. February 21, 2018 marked the close of the Cycle 8B reporting window. We are now midway through the Cycle 8C reporting period, which opened on February 21, 2017 and closes on February 21, 2019. DOB NOW: eFiling Required Now! The DOB now requires that all FISP reports be filed digitally through its “DOB NOW: Safety” web portal. All QEWI’s and Owners (or Owner’s Representatives) will need to have an “eFiling” account to access DOB NOW in connection with these filings. February 21, 2017 signaled the close of the Cycle 8A reporting window. February 21, 2018 marked the close of the Cycle 8B reporting window. Penalties for late filings and unrepaired UNSAFE conditions are significant, and accrue rapidly. If you have not yet filed your Cycle 8A or Cycle 8B report, you must do so IMMEDIATELY. We are midway through the Cycle 8C reporting period. The Cycle 8C filing deadline is February 21, 2019. Your Cycle 7C report listed SWARMP conditions: Any SWARMP (Safe with a Repair and Maintenance Program) conditions identified during the prior Cycle 7C that have not been repaired at the time the Cycle 8C report is filed with the DOB will default to UNSAFE, triggering violations and potential penalties. Be sure to confirm that all Cycle 7C SWARMP conditions have been repaired, and be sure to file your Cycle 8C report prior to the filing deadline. Your Cycle 7C report was SAFE, or if you have successfully repaired any prior Cycle 7C SWARMP conditions: Now is the time to conduct your Cycle 8C critical examination and file your report. If your Cycle 8C report identifies any “new” UNSAFE conditions, they must be addressed IMMEDIATELY. The Owner must immediately commence repairs or reinforcement, and install a sidewalk shed or other measures to secure public safety. An UNSAFE condition must be corrected within 30 days, or renewable time “Extensions” must be obtained from the DOB. After the UNSAFE condition has been satisfactorily repaired or stabilized, the QEWI files an “Amended“ report with the DOB, in which the Unsafe condition is re-classified as either Safe or SWARMP, as the case may be. If you have already filed your Cycle 8B report, and your building has been classified SAFE, or SWARMP: Well Done! For specific questions, or if you would like us to provide a proposal, please contact us. 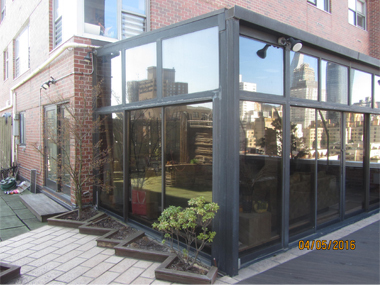 The general requirements governing facade inspections in NYC are contained in Article 302 of Title 28 of the NYC Administrative Code, entitled Maintenance of Exterior Walls. Detailed inspection and reporting requirements, as well as penalties, are delineated in 1 RCNY §103-04 Periodic Inspection of Exterior Walls and Appurtenances (DOB Rule 103-04). The program applies to buildings greater than 6 stories in height, and includes buildings that are 6 stories above a basement, and buildings that are 6 stories plus a “penthouse” floor. The program does not apply to a buildings that are 6 stories above a cellar. A BASEMENT is a story partly underground, but having more than one-half its clear height above the grade plane. A CELLAR is a story partly or wholly underground, but having one-half or more of its clear height below the grade plane; Cellars are not counted as stories in measuring the height of buildings. To confirm whether your building has a cellar or basement, you can check the Certificate of Occupancy. The program also applies to exterior walls greater than 6 stories in height, on otherwise non-applicable buildings. For example, buildings situated on sloping sites, or with depressed yards or courts larger than 900 sf. The program mandates a Critical Examination of the building’s exterior walls by a Qualified Exterior Wall Inspector (QEWI), during a 2 year window, within cycles occurring every 5 years. A physical examination from a scaffold or other observation platform (a “close-up inspection”) is required for a representative sample of the exterior walls. The QEWI shall determine what constitutes a representative sample. The representative sample shall include at least one physical examination along a path from grade to the top of an exterior wall on a street front using at least one scaffold drop or other observation platform configuration, including all setbacks. A Qualified Exterior Wall Inspector (QEWI) must be a licensed architect or professional engineer with at least 1 year of relevant experience per 1 RCNY §101-07 Approved Agencies. The Critical Examination report must be filed with the DOB within 60 days of completion of the final visual inspection, and not more than one year after the completion of the physical examination (scaffold drop). 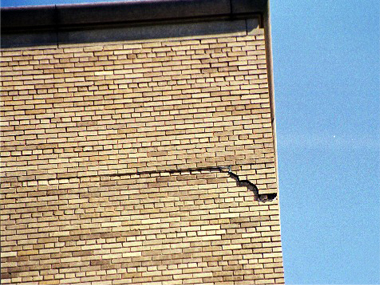 Buildings, and conditions, are classified as Safe, Unsafe, or Safe with a Repair and Maintenance Program (aka SWARMP). Safe is defined as a condition of a building wall, any appurtenances thereto, or any part thereof, not requiring repair or maintenance to sustain the structural integrity of the exterior of the building and that will not become unsafe during the next five years. 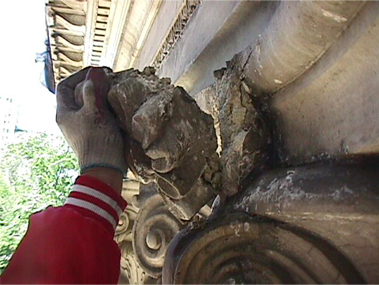 Safe with a Repair and Maintenance Program (SWARMP) is defined as a condition of a building wall, any appurtenances thereto, or part thereof, that is safe at the time of inspection, but requires repair or maintenance during the next five years in order to prevent its deterioration into an Unsafe condition during that five year period. The QEWI must provide, for any SWARMP condition, a specific date shown as month-and-year (MM/YYYY) by which the condition must be corrected. A QEWI who becomes aware of a physically Unsafe condition during a Critical Examination inspection is required to immediately notify the DOB and the building owner using a “Notification of Unsafe Conditions” (FISP3) form. The owner must immediately commence repairs, or reinforcement, and install a sidewalk shed, or other measures to secure public safety. An Unsafe condition is to be corrected within 30 days. Renewable Extensions of Time (see below) may be granted by the Commissioner if certain conditions are met. After the Unsafe condition has been satisfactorily repaired, or stabilized, the QEWI files an “Amended“ report with the DOB, in which the Unsafe condition is re-classified as either Safe or SWARMP, as the case may be. Sidewalk sheds must remain in place after Unsafe conditions have been repaired until an Amended report has been filed with the DOB, and a DOB inspector has visited the site and confirmed that no Unsafe conditions remain. The Amended report will then be stamped “accepted” by the DOB. Under certain circumstances the QEWI may request permission for the removal of the shed by submitting a signed, sealed statement certifying that an inspection was conducted, the conditions were corrected, and the shed is no longer required. Permission to remove all or part of the shed may then be granted based on an inspection by a DOB inspector. For buildings classified as Unsafe as a result of an unrepaired prior-cycle SWARMP condition, immediate notification of the DOB (by FISP3) is not required, unless a condition is observed to be physically hazardous at the time of the inspection. However, upon filing of the current cycle report with the DOB, the condition is subject to violation and must be repaired immediately (as is the case for all Unsafe conditions). There is no distinction in the building code or DOB Rule 103-04 between physically unsafe conditions and what are informally termed “Administrative” Unsafe conditions. Immediately install public safety measures, such as a sidewalk shed, construction fence, etc., at the Unsafe locations. Correct Unsafe conditions within 30 days from the date the DOB was notified of the Unsafe conditions. When the Unsafe conditions have been corrected, file an Amended FISP Critical Examination Report with the DOB within 15 days. Most Unsafe conditions cannot be corrected within the allotted 30 days. Therefore, the owner may file with the DOB for renewable “Extensions of Time.” The DOB will typically grant “Initial” and “Additional” extensions of up to 90 days, upon submission of forms FISP1 or FISP2 and a letter from an architectural or engineering firm describing the scope of work to be completed, the timetable for completion and confirmation that safety measures (e.g. sidewalk shed) are in place. Extensions are required to be renewed until the Unsafe conditions have been satisfactorily corrected and an Amended Critical Examination Report has been filed and accepted by the DOB. An “Amended” report is filed to change the status of a building for which an Unsafe Initial Critical Examination report had been filed to either Safe or SWARMP, based on whether the Unsafe condition has been successfully repaired (Safe) or simply stabilized (SWARMP). A “Subsequent” report may be filed at the owner’s option to change the status of a previously filed SWARMP report to a Safe report. Failure to File an Initial Report: Failure of the owner to file an initial Critical Examination Report prior to the reporting deadline will result in a penalty of $1,000 per year immediately after the end of the applicable filing window. Late Filing (Initial Report): There is an additional $250 per month penalty for late filing, commencing the day following the filing deadline. Failure to Correct Unsafe Conditions: An owner who fails to correct any Unsafe condition will face a penalty of $1,000 per month, pro-rated daily, until the condition has been corrected, and an acceptable Amended report has been filed, unless an Extension of Time to complete repairs has been granted by the Commissioner. In Cycle 8, if a building has failed to file a Cycle 7 report, the DOB will issue a “No Report Filed” (NRF) violation. The report filed in Cycle 8 will be termed a “Combined” Cycle 7 and Cycle 8 Report. When the report has been filed the DOB may then retroactively levy penalties for both Failure to File ($1,000) plus Late Filing ($250/month). For “new” buildings greater than 6 stories in height, and for alterations which involve vertical enlargements of existing buildings to a height greater than 6 stories, initial Critical Examination Reports are due 5 years from the date that the first Temporary Certificate of Occupancy (TCO #1) for the building was issued. For the current cycle, if the 5 year anniversary of a building’s first TCO falls prior to or within the applicable inspection “sub-cycle” (based on the last digit of the building’s Block number), a report is due in Cycle 8. If the 5 year anniversary falls after the applicable Cycle 8 “sub-cycle,” the initial report shall be due during the applicable sub-cycle of Cycle 9 (2020 -2025). The filing requirements for recently constructed or vertically enlarged buildings are summarized in the Table below. The Date of the First Temporary Certificate of Occupancy (TCO #1) for a recently constructed new building can be obtained from the DOB Buildings Information System (BIS) website. For assistance in identifying the date of TCO #1, please contact us. 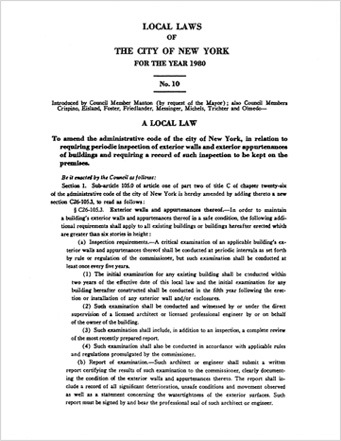 Local Law 10 of 1980, as amended and amplified by Local Law 11 of 1998, is the oldest continually enforced facade inspection law in the nation. 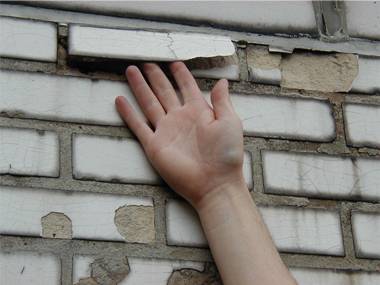 The program governed by these laws is now referred to as “FISP” signifying the NYC Department of Building’s Facade Inspection Safety Program. There are upwards of 12,500 buildings subject to the inspection requirements of FISP. 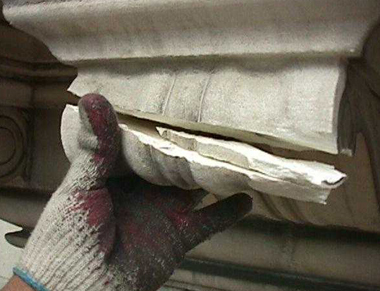 New York City’s initial façade inspection law, Local Law 10, was enacted in February 1980, shortly after a piece of masonry fell from the facade of a building on Manhattan’s Upper West Side, killing a pedestrian. The New York City Council, in an effort to minimize the chances of such accidents ever occurring again, amended the NYC Building Code, mandating that owners of applicable buildings have their exterior walls and appurtenances periodically inspected by a licensed professional engineer or registered architect. The first facade inspection cycle ran from February 21, 1980, to February 21, 1982. In December 1997 a large section of a side wall of 540 Madison Avenue rained down on the street from above the 33rd floor. Tons of debris were left hanging in a safety net that had been installed as a precautionary measure after the bulge in the wall was observed. Remarkably, injuries were relatively minor. Less than three months after the failure, on March 13, 1998, Mayor Giuliani signed Local Law 11 of 1998 into immediate effect. Local Law 11 bears no numerical relationship to Local Law 10. Local Law 11 was the 11th law enacted by the City Council during the year 1998. Like Local Law 10, it was an amendment to the Building Code. The main thrust of the legislation was to remove exemptions permitted under Local Law 10. Local Law 11 became effective during the 5th cycle, between 2000 and 2002. 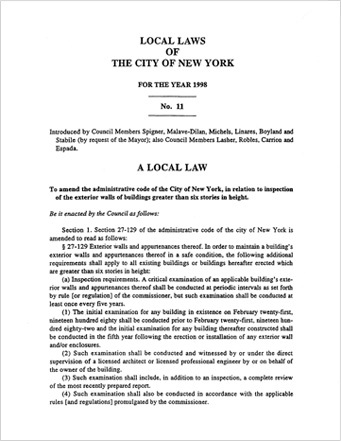 In August 2007, Mayor Bloomberg signed Local Law 38 of 2007, which required the Buildings Commissioner to establish “staggered inspection cycles” for buildings governed by the facade inspection requirements of Local Laws 10 and 11. The new law spread the approximately 12,500 inspection reports processed by the DOB over a three year period. In February 2009, at the start of Cycle 7, the DOB amended its rule detailing the staggered inspection cycles. FISP inspections now occur in three “staggered” two-year “sub-cycles,” commencing one year apart. Buildings are divided into three groups, (Sub-cycles A, B and C), based on the last digit of their respective “Block” number (as in “Block and Lot”). See Cycle 8 Information tab for details. In April 2013, in response to a tragic balcony accident, DOB Rule 103-04 was again amended to include inspection of balcony railings to “insure their adequacy and structural integrity.” The rule was further revised by a departmental memo in May 2015 expanding the interpretation of “balcony” railings to include handrails and guards on all terraces, walkways, corridors, fire escapes, roofs, and setbacks, as well as “any other related handrails and guards.” Balcony enclosures as well as rooftop greenhouses and solariums were incorporated by a departmental summary issued in July 2015. The stated purpose of NYC’s façade ordinances is improved pedestrian safety. Every façade type (old and new) exhibits characteristic forms of deterioration. Water is the enemy of building facades, particularly in our NYC climate with its winter freeze/thaw cycles, salt air from the marine environment, and air polluted with chemical salts. Water infiltrates facades through small cracks in masonry and through deteriorated sealant via capillary action. Pre-World War 2 buildings, many approaching 100 years or more in age, have an intrinsic advantage over more modern structures. They were built with a fortress mentality. Solid masonry walls 24 inches thick were not uncommon. The masonry mass of the wall was used to resist water penetration. Architectural details such as cornices and belt courses were not only ornamental; they served the functional purpose of helping the façade shed water. However, advanced age, and lack of proper and systematic maintenance of many older buildings have exploited the inherent weaknesses in the systems. The life expectancy of many lighter gauge Post-World War 2 “cavity wall” brick-faced facades, now approaching 70 years in age, will not equal that of their more massive predecessors. 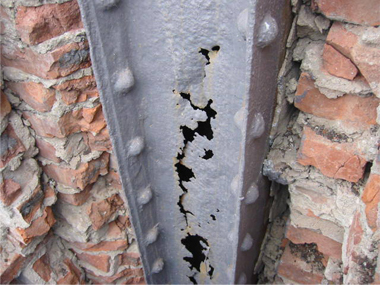 Small galvanized metal ties and anchors bonding the exterior brick course to back-up block were either not originally installed in adequate numbers, or have deteriorated. In the current speculative building boom, facades often comprise a mosaic of varied materials: expansive glass curtain walls, precast brick and metal panels, and stucco. Assembly of these facades requires rigid construction tolerances in both materials and workmanship, which sadly are not being met. Many of these buildings are already displaying symptoms of façade failures such as water and air penetration – shortly after they are completed. 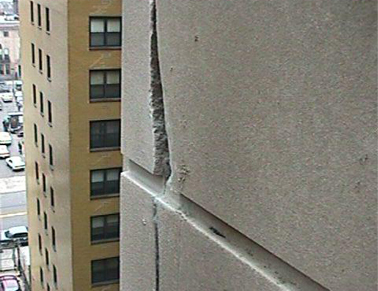 The requirements of the façade NYC’s inspection laws, when followed, serve to provide a reasonable degree of protection of pedestrians from catastrophic façade failures. Furthermore, while Local Law 11 / FISP is sometimes perceived as a “nuisance” for building owners, it presents an opportunity for knowledgeable owners to take a longer view, exploiting an opportunity for preventive maintenance, thereby reducing future deterioration, and the higher cost of deferred maintenance. This portion of the 2014 NYC Administrative Code Section contains the critical FISP/LL11 requirements enacted by the NYC City Council. This section supersedes the text of Local Laws 10/80 and 11/98. The rule, promulgated by the DOB, contains the detailed technical and administrative requirements governing facade inspections, elaborating on the “skeletal” requirements contained in Article 302. This rule contains requirement for QEWI’s (Qualified Exterior Wall Inspectors), as well as other Special Inspection Agencies. The “Balcony Memo” memo outlines inspection and filing requirements for balcony railings as well as other fall-protection related railings and guards. This document includes further interpretations related to compliance with requirements of the May 5, 2014 Balcony Memo, as well as building code citations. This memo to industry professionals amplifies DOB concerns related to FISP/LL11. The Façade Page contains useful information and additional links. This page contains installation guidelines.